﻿ Earthrise Press. A new global, universal vision of life on this planet. a new global, universal vision of life. The story of humanity from Blombos Cave to the dark side of the moon. In a world of Quantum science, Apollo, the Greek god of poetry, calls all the poets of the nations, ancient and modern, East and West, to assemble on the moon to consult on the meaning of modernity. The Parliament of Poets sends the Persona, the Poet of the Moon, on a Journey to the seven continents to learn from all of the spiritual and wisdom traditions of humankind. On Earth and on the moon, the poets teach a new global, universal vision of life. 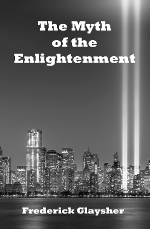 The Myth of the Enlightenment: Essays. 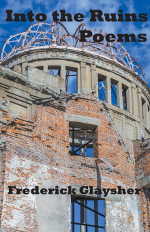 Fourteen years in the making, The Myth of the Enlightenment is Frederick Glaysher’s first collection of literary essays since The Grove of the Eumenides in 2007. Divided into three sections, these essays and reviews were all written during the 21st Century, with many of them central to his evolving intellectual and spiritual struggle to write his epic poem, The Parliament of Poets, which he completed and published in late 2012. The Grove of the Eumenides: Essays on Literature, Criticism, and Culture. 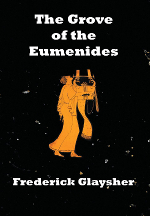 Twenty years in the making, in The Grove of the Eumenides, Frederick Glaysher invokes a global vision beyond the prevailing postmodern conceptions of life and literature that have become firmly entrenched in contemporary world culture. 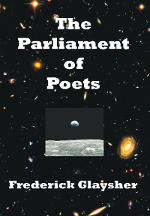 From New Preface (April 4, 2015): "All the essays in The Grove of the Eumenides were written after 1982 when I wrote my first draft of a plot outline for my epic poem The Parliament of Poets. These essays constitute and record my background study, as it were, over a period of more than twenty years, leading up to their publication in 2007..."
Into the Ruins: Poems. Twenty years in the making, beyond Postmodernism, probing the nihilism of the age, Into the Ruins confronts much of the human experience left out of the balance by postmodern poetry, often compared to the Alexandrians and the Neoterics, when writers similarly concentrated on the minor themes of personal life, while ignoring the challenging experience of the public realm. Suffused with a global tragic vision, into the ruins of the 20th Century, Glaysher has his gaze fixed firmly on the 21st. 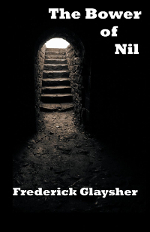 The Bower of Nil: A Narrative Poem. Fifteen years in the making, overturning the nihilism of Nietzsche, moving beyond Postmodernism, Peter Marsh, an academic philosopher struggling with analytical philosophy, weighs modern life in a conversation with his friend, David Emerson, a businessman. Brought together after long separation by the brutal murder of Mary, Peter’s wife, a time of devastating loss and crisis, their friendship inspires a dark night of the soul, during which Peter’s meditations range over several hundred years of philosophy, politics, religion, social change, the dilemmas of existence, evoking a vision of the complexities of the 21st Century, the United Nations, and global governance. Structured around classical Greek choral movements, the first section ponders themes from Japanese Buddhism, while the second and third survey Western philosophy from Aristotle and Plato through Descartes, Pascal, Kierkegaard, Nietzsche, Wittgenstein, Heidegger, Derrida, and others, in a powerfully dramatic grappling with philosophy, East and West. Letters from the American Desert: Signposts of a Journey, A Vision. 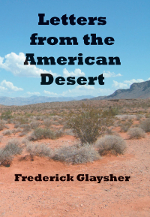 Twenty years in the making, in Letters from the American Desert, Glaysher reflects on the cultural, political, and religious history of Western and non-Western civilizations, pondering the dilemmas of postmodernity, in a compelling struggle for spiritual knowledge and truth. In what is a highly autobiographical work, fully cognizant of the relativism and nihilism of modern life, Glaysher finds a deeper meaning and purpose in a universal Vision. Confronting the antinomies of the soul, grounded in the dialectic, Glaysher charts a path beyond the postmodern desert. Alluding extensively to Martin Luther and W. B. Yeats at All Souls Chapel, “metaphors for poetry,” from Yeats’s book A Vision, Glaysher considers the example of the global, universal message of the oneness of God, all religions, and humankind, holding out a new hope and peaceful Vision for a world in spiritual and global crisis. Far from a theocracy, Glaysher envisions a modest separation of church and state, as the will of God, in an unorganized religion, a universal synthesis of all spiritual and wisdom traditions, in harmony and balance with universal peace, in a global age of pluralism, where religious belief is a distinctive mark of the individual, not collective, communal identity. 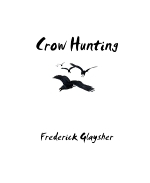 Crow Hunting: Songs of Innocence. An eChapbook of nine poems written after the poets Henry Vaughan, Blake, Bryant, Emerson, Basho, Hafez, Attar, Rumi, and Tagore. From the Preface: ". . . so I sought in words of poetry to intimate to an age of doctrinaire nihilism that God still exists, calls us always, if only we will pray and listen to Her." Theosophical Society of Detroit - Friday, December 7, 2018. 7:00 - 9:00 pm. 27745 Woodward Avenue, Berkley, Michigan. October 1, 2018. Monday. 7:00 to 8:30 pm. Troy-area Interfaith Group Authors' Night. Hosted by Central Woodward Christian Church, 3955 W. Big Beaver Rd., Troy, Michigan. August 11, 2018. Saturday. 2:00 - 5:00 pm. Sacred Grounds. 2095 Hayes. San Francisco, California. August 10, 2018. Friday. 7:30 to 9:00 pm. San Francisco's Shelton Theater, reviving the art of the rhapsode. Tickets. July 11, 2018. Wednesday. 7:00 - 9:00 pm. Theosophical Society of Detroit. 27745 Woodward Avenue, Berkley, Michigan. March 22, 2018. Thursday. 7:00 pm. Farmhouse Coffee & Ice Cream. 32644 Franklin Rd. Franklin Village, Michigan. Parabola, Spring 2019. Change (51).